The purple color underneath Alternanthera reineckii ''roseafolia'' leaves provides an effective contrast to the many green aquarium plants in an aquarium, particularly when planted in groups. Good light encourages the leaves to turn red. Most Alternanthera species are difficult to grow, but this one is relatively undemanding. Easy to propagate by nipping off the terminal bud and planting it in the bottom. This also makes the mother plant bushier, because more side shoots are formed. Alternanthera reineckii is one of many ornamental plants that thrive in the aquarium, aquatic plants are plants that have adapted to living in aquatic environments. These plants require special adaptations for living submerged in water, or at the water's surface. The most common adaptation is aerenchyma, but floating leaves and finely dissected leaves are also common. Alternanthera reineckii is great for fry (baby fish) to hide from aggressive fish, it is also an oxygenator. However, remember the red color in the leaves is an indicator that this plant needs a good lighting system for the plant to grow and thrive. 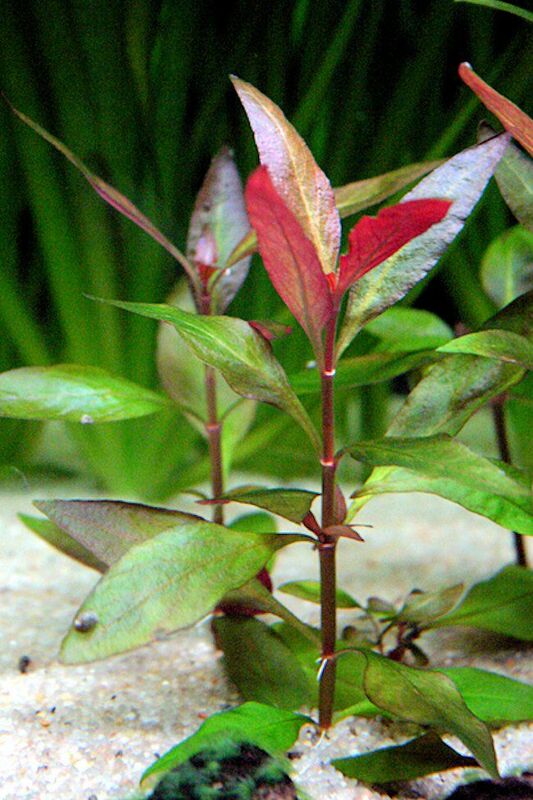 Alternanthera reineckii is an easy to grow stem plant that will thrive in most aquariums. The plant typically grows to a height of 10 to 20 inches, even taller under high light conditions. The width of each stem is about 4 to 6 inches, based on leaf growth. The leaf is oblong-elliptic to ovoid. In order to achieve strong shoots, the substrate should be nutrient rich and light intensity high. Three to five strong specimens can be used for the background area to help accent the shades of green aquarium plants. Alternanthera reineckii can grow well in both hard and soft water although soft, slightly acidic water is best. The optimum growth temperature is 75 to 80.6 F, although it can grow in temps from 71.6 to 82.4 F. It can withstand temps from 39.2 to 84 F.
Alternanthera reineckii requires moderate to high lighting (2 to 4 watts/gal) to do well. If kept in low-light tanks the lower leaves tend to fall off. Separate each stem and plant individually. This will result in better growth and the lower leaves will still receive some light as this aquarium plant grows taller.